Welcome to Mars College! We truly believe that every student in our college is a star, hence our motto 'Eluceat Omnibus Lux'- 'Let the Light Shine Out from All'. Students and staff in the College always put their all into activities and meeting and displaying the Sudbury School Values. Us Martians have a strong college spirit- it was this which enabled us to achieve victory in the first year of the College System being set up. 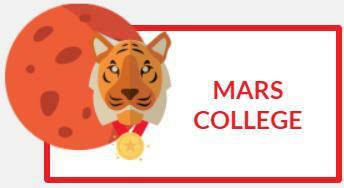 From Staff Bake-Offs and Sport Contests to Buddying, Poetry Slams and Class Dojo Competitions (to name a few), Mars College are a community and we are proud to be represented by the Tiger, a courageous, energetic and determined animal. Our planet, Mars, is sometimes known as the Red Planet and is the fourth planet from the sun. It is the only other planet (aside from Earth) which is considered to be hospitable to life. Known for being the theme song of Rocky III and a huge hit in the 1980s, students always enjoy acting out their inner athlete to this during College Assemblies! The mention of a Tiger (our College Animal) and the theme of perseverance make this our ideal College Song.